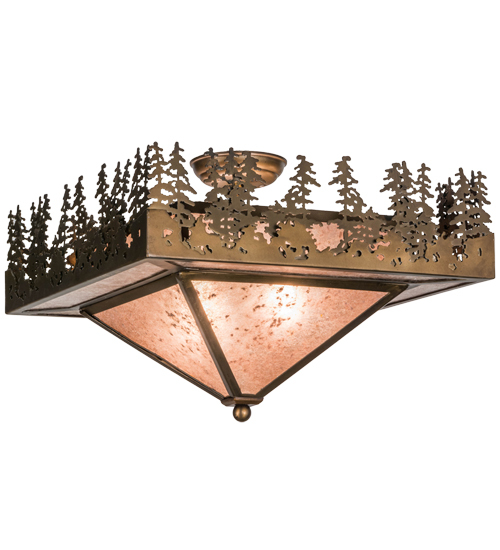 Description: You can almost smell the fresh clean scent of Pine with this lighting fixture... A nature inspired stand of Tall Pine trees is depicted while the morning sun rises over a lake. With soft ambient light projected beautifully through a Silver Mica shade and top diffuser, this fixture is complemented with Antique Copper finished accents and frame. Custom crafted by the hands of Meyda artisans in our manufacturing facility at the foothills of the Adirondack Mountains here in the USA.